Podere La Villa is the ideal vacation spot for those who wish to reinvigorate both body and mind. This enchanting area is peaceful and silent, far from frantic city life. However its excellent location, not far from Florence, Siena, San Gimignano, Volterra and numerous other famous Tuscan towns, makes for easy visits around this beautiful countryside. 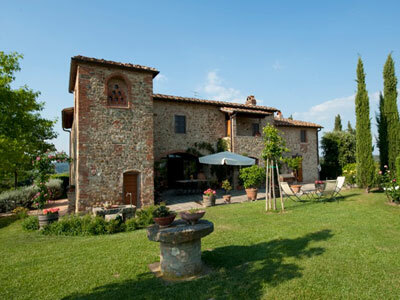 The Villa is found in the Chianto Classico hills and is surrounded by olive groves and vineyards. Guests can enjoy walks around the Villa’s surrounding hillsides, and every window of the Villa offers a magnificent view of this marvelous scenery. The owner of the Villa lives in an independent apartment on the upper floor of the Villa. The Villa is located 6 km from the village of San Casciano, near Florence and Siena and close to numerous and fascinating Tuscan towns including San Gimignano, Volterra and all the little villages of the Chianti Classico area. The area offers you the possibility of going on nice walks and enjoying the tranquility of the countryside and the surrounding vineyards. High Season: 27/Apr - 01/Nov. Med Season: 15/Mar - 26/Apr; . Low Season: the villa cannot be rented during the other months.